Celebrating the journey of Ontario’s food – from farm to table. 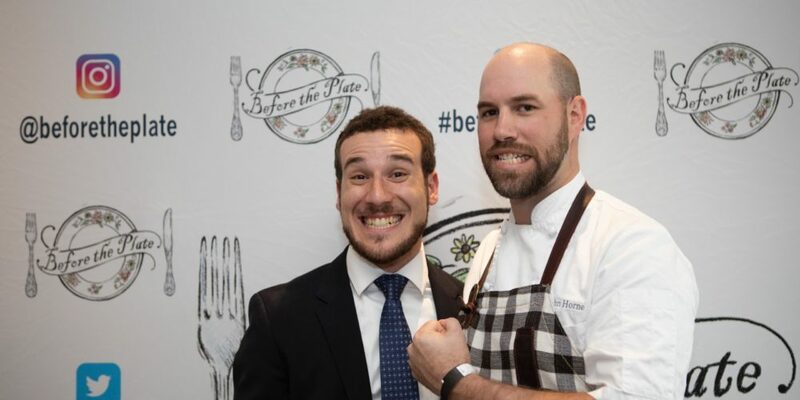 On Sunday, August 5th, we were thrilled to host the post-premiere dinner of Before The Plate, an ambitious food and agriculture documentary produced and directed by Dylan Sher and Sagi Kahane-Rapport. The film stars our own Executive Chef John Horne, who crafts a dish made up of 10 locally sourced ingredients, including beef, honey, celery and more. Before The Plate traces each ingredient back to its origin, taking a deep dive into the lives of the farmers who produce our food. To commemorate the film’s premiere, we hosted 125 guests for a three-course sit-down dinner at Canoe. Guests included the film crew and their friends and families, as well as the farmers featured in the documentary. Following a lively cocktail reception featuring tasty passed bites of beef sliders, Kolapore trout, and fresh ricotta and honey, guests took their seats in our main dining room. Chef John presented each course, featuring ingredients supplied by our guests of honour: Ontario farmers. Of course, the main dish featured the same plate from the film itself: Larded Beef Tenderloin with charred onions, honey-roasted carrots, tater tots, green-tomato chutney, and bread sauce. As passionate supporters of locally sourced meats, grains and produce, it was a true pleasure to showcase some of the best ingredients from around the province. We’d like to extend a big thank you to the Before The Plate team for including us in this project, as well as all the dedicated and hardworking farmers to whom we owe much of Canoe’s success.